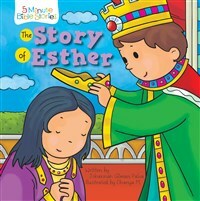 Esther was known for her kind heart and courage. These qualities combined with her steadfast love for God helped her face adversity and save the Israelites in Persia. In this wonderful story of bravery, learn the power of having faith and being courageous. Begin your child's lifelong love for reading the Bible by sharing these 5 minute Bible Stories made just for kids featuring characters played by kids. Johannah Gilman Paiva grew up reading children's books to her eight siblings. Her career has taken her from the magazine publishing industry to authoring and editing children's books. She now lives in her hometown of Nashville, Tennessee, and gains inspiration from the adventures and antics of her husband, small children, and their family dog. Dhanya M. loves drawing, painting, and storytelling. She works as an animation designer and freelance illustrator with her husband, who is also an illustrator!